Soldiers based out of Fort Riley, Kansas’ 2nd Brigade, 1st Infantry Division will begin training in March 2013 in order to prepare for a project that will send troops to as many as 35 African nations, the Associated Press reports. Citing a growing threat from extremist groups, including those with ties to al-Qaeda, the Department of Defense is hoping to install American soldiers overseas in order to prepare local troops there for any future crises as tensions escalate. Earlier this month, DoD sources with insider knowledge told the Washington Post that US troops will soon be en route to the nation of Mali in order to thwart the emerging threat of Islamic extremists, including al-Qaeda aligned insurgents. With the latest news from the Pentagon, though, Mali will be just one of many African nations hosting US troops in the coming year. According to the AP’s update this week, soldiers will be sent overseas in the new year to assist only with training and equipping efforts, and are not necessarily permitted to participate in military operations. Should the Pentagon ask the troops to engage in battle, however, the secretary of defense could sign off on an order that would allow as much. Additionally, the AP says that US troops will head specifically to Libya, Sudan, Algeria and Niger in order to prepare for any advances from al-Qaeda linked groups. 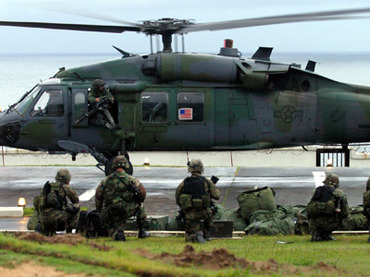 Americans will also train and equip forces in Kenya and Somalia, reportedly, in order to stand up to al-Shabab militants. Despite the troops being deployed to more than half of the countries in Africa, though, the AP reports that Uncle Sam will try to avoid giving the impression that the United States is leaving a substantial footprint across the continent. Sources speaking with the AP say that the United States has already prepared nearly 100 different exercises and training programs to conduct with African troops during the coming year.